Another weekend has flown by and cannot believe that December is almost here. It also seems to be that time of the year where my children are home more often than at school even though the Summer holidays have not officially commenced. As an added bonus the warm weather is lagging a little behind (I really don't enjoy hot summer days and nights), with Melbourne exceeding average rainfall for the first time in 13 years. The task of basting my new quilt project was scheduled for the weekend, and was finished just prior to heading off to work on Sunday evening. I have already shared the above picture on my Facebook page where my basting was referred to as Uber-basting : ) I do use A LOT of pins to ensure that the quilt sandwich remains stable whilst being wrangled (carefully!) whilst quilting. Quilting has commenced, and although I had planned to quilt lines parallel with the seams lines (because it would be easier as you can use the seam lines as a guide for stitching a straight line), I have instead opted to quilt straight lines perpendicular to the seam lines. It is more difficult to keep the long vertical lines running straight but it will give this quilt the contrast it needs. I have marked lines with a Hera Marker 1 1/4 inches apart as a foundation to stabilize the quilt. Once these lines are all stitched, I then stitch another (unmarked) line in between the foundation lines. As a result the stitching lines are approximately 3/4 inch apart. Now, back to the sewing machine, there is more quilting to be done. Happy Stitching everyone! 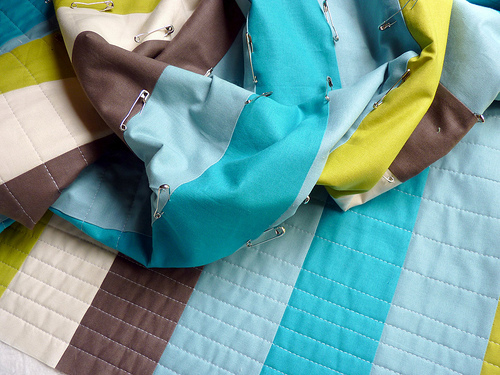 How do you get your quilt to lay so flat while you are pinning? I would be curious to see how your process works since pinning makes for easy quilting if you don't have tucks in your top or back. That looks like it's going to be a stunning quilt! I love your color choices! 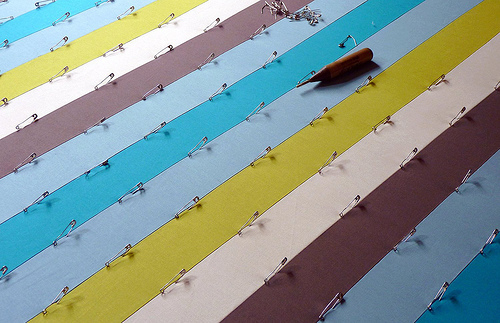 And I would also love to see how you get your quilt so flat while pinning! 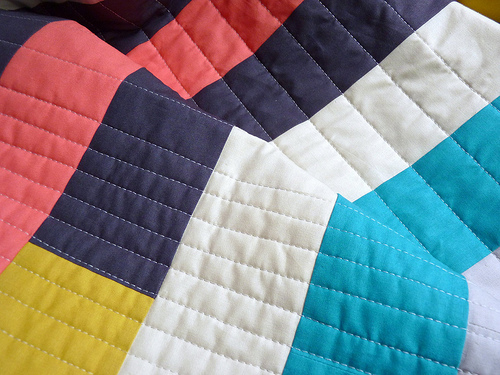 Loving how you are quilting this! Excellent choice! I would certainly recommend alternating the direction from which are are sewing for every line of stitching. It does help in preventing distortion/pulling of the fabric. It all comes down to basting. If your quilt top and backing are basted at the same "tension" then you won't get distortion. This "tension" is something you get a feel for (and get better at) over time. If you notice that there is excess fabric at the back of the quilt, which is causing pulling and puckering, then next time you baste a quilt be sure to apply the quilt top less firmly when basting. I tape the quilt backing to the floor quilt, quite firmly (I do pull but not stretch the fabric). Similarly, I firmly pin the quilt top to the backing/batting, pinning the four sides first,before I pin the rest (center) of the quilt -- That's why the quilt looks so smooth in the picture. I'm also curious about the quilting in different directions or all the same way? I'm sure it's all your basting pins that allow for your accuracy. Uber-basting... maybe my next quilt. Sigh, tonight I am frustrated with finding mistakes in my own work. Oh that's funny....for a minute I thought you were doing some at 3/4 and some wider....they're obviously the ones you're now filling in! Happy quilting! It's a beauty Rita and the quilting so fun! I don't know how you can do all that basting on the floor! You must be a lot younger than me! I have two banquet tables that I set up next to each other in the basement. I can tape the quilt backing to it and base a pretty large quilt. that looks amazing! and thanks so much for the tip on basting, i'm just about to baste my mom's string quilt, your tips will definitely help! oh wow, i love this quilt before I have even seen it!!! Clever! I have to buy one of those Hera Markers. I am just quilting a pattern that a marked with a chalk pen. But of course, now I have to brush all the marks off. Annoying. I wish I had known about this marker thingy before. Thanks for sharing. And your new quilt is looking lovely by the way. Your accuracy - the amazingly straight lines of both your seams and quilting - is truly inspirational! I'm thinking that I need more pins! You do beautiful work. Beautiful work Rita, lovely colours! I love this quilt! The colors are beautiful! I know that all of that straight line quilting was tedious, but the end result is absolutely gorgeous! What kind of iron do you use? Do you prewash your fabrics or not? I've never seen fabric look so crisp and smooth! I'm actually very curious about all your fabric prep steps, like how you cut strips - it seems that the fabric is perfectly on-grain in order to get such crisp straight seams in your strip piecing. Please let us in on your secrets!!! Thanks so much for the tips on direction of quilting and basting. I've never heard of the idea of pin-basting around the edges first--I'll give that a try. Also, as I look at the photo, I'm thinking that putting the pins right in the seam lines--as well as so close together--may also prevent shifting; I'll give that a try. Wow, thems a lot of parallel and perpendicular lines. It's lovely and modern. I do not think this is overpinning at all. Looks pretty close to right to me. And look, no puckers! You are a machine! I love seeing your quilting. Inspires me to be a bit more careful in my quilting.